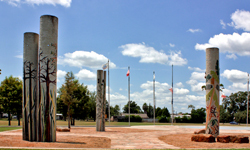 The military memorials in Veterans Memorial Park spread out across its grounds. 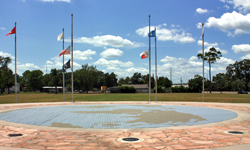 A round central plaza contains bronze reproductions of sixteen highly regarded United States military medals for discipline, courage, and sacrifice. 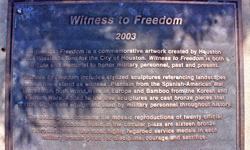 A curved seating wall is decorated with tile mosaics of twenty official campaign ribbons. 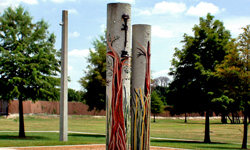 Nearby, vertical sculptures suggest stylized trees from the battlegrounds of America’s wars: plantain for the Spanish-American War; laurel for the European battlegrounds of World Wars I & II; and bamboo for Korea and Vietnam.